The microphone doesn’t show up in the Capture Devices, instead it shows the Playback Device. How can I solve this? The only way to have microphone working is by unmuting the microphone but then I also hear myself which I don’t want to. EDIT: [http://i.imgur.com/B86DGlH.png]">[http://i.imgur.com/B86DGlH.png] I was hoping I’d find Microphone and Line-in… guess not. I compared your screens to mine and there are slightly different. On my input tab there is no “profile” box at all. Have you installed all available system updates? That probably has to do with drivers. I can set my input to mono or stereo. So for example If I connect my Dreamcast to the Line-in I can set the card to play it in Stereo or Mono. Perhaps your sound chip either doesn’t support one or the other or the drivers don’t have that functionality. 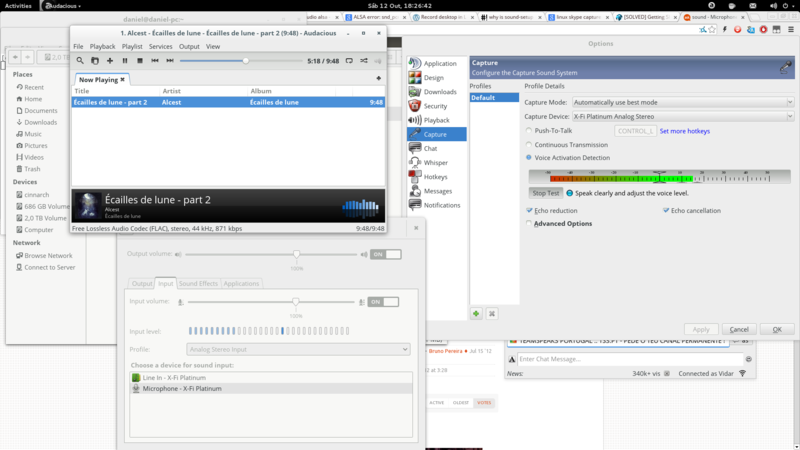 NOTE: I literally stayed the entire afternoon until now trying to figure this crap out and I still don’t know how to record ffmpeg the way I want and stream on twitch… aaaaargh Linux I like you so much but you’re soooo messy!! Oh I totally understand. Pretty much anyone who uses or has used linux should be able to relate. I think we all have had those days/nights down the linux rabbit hole!